Crime Prevention is everyone’s business. 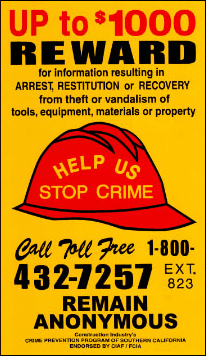 SINCE 1984, CPP IS THE LEADER IN CONSTRUCTION CRIME PREVENTION IN SOUTHERN CALIFORNIA. Find out how The CPP Partner Program will work for you. Let’s get started on recovering your equipment. Decals, Signs, and Marking Tools. We’ve got it all. Find all of your construction equipment resources here. Copyright © 2018 CPP Crime Prevention Program. All rights reserved.